The forecast calls for the annual Leonid meteor shower to be at its best during the predawn hours on Wednesday, November 17, or Thursday, November 18. Which morning will be best for the U.S.? 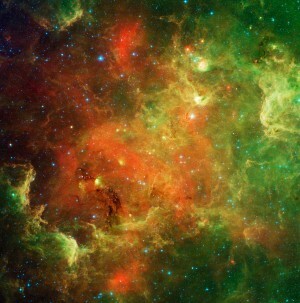 You’ll have to go out under a clear dark country sky to see for yourself. If the prediction holds true, Asia should be in the best position to see the Leonids at their peak on Thursday – in between moonset and dawn. Meteor showers are notorious for defying expectations, though, so any prediction should be regarded as a best guess, not an ironclad guarantee. The illustration at top shows what the Leonid shower might look like in a year that this shower erupts into storm, bombarding the sky with thousands of meteors – sometimes also called shooting stars or falling stars – per hour. Will there be a Leonid storm in 2010? That’s one prediction we can make with a fair amount of certainty, and the answer is no. No storm or heightened meteor activity is anticipated for the Leonid meteor shower in 2010. This year’s peak rate may offer 15-20 meteors per hour. 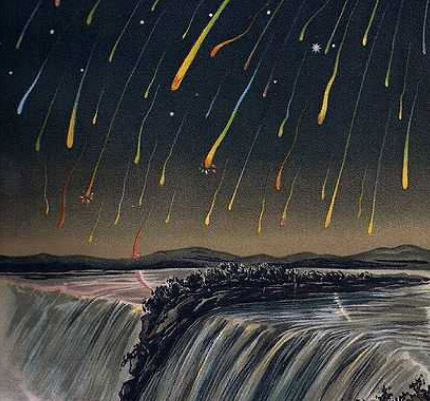 The Leonid shower has produced some of history’s most impression displays of meteors. The best displays in recent history took place in 1833, 1866 and 1966. Whenever our planet Earth plows through an unusually thick clump of debris in space – left behind by comets in orbit around the sun – hundreds of thousands of meteors can streak across our nighttime sky. For instance, observers in the southwest United States reported seeing 40 to 50 meteors per second (that’s 2,400 to 3,000 meteors per minute!) during a span of 15 minutes on the morning of November 17, 1966. Modest though this year’s shower may be, look for at least a sprinkling of Leonids in the dark hour before tomorrow’s dawn. Be sure to find a dark sky!